Crazy Under Crisis: Which Side? Welcome to my side of the bed! 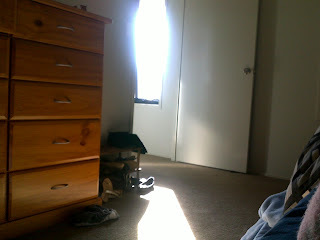 Every morning I am blinded by streams of sunlight pouring through this useless window. It servers no purpose what so ever in this corner of the house other than to piss me off and mock my lack of sleep. Now normally I wouldn't mind, it's my alarm clock to get up and begin the daily routine of waking the kids, school lunches, breakfast, uniforms ready, backpacks... yad yad yad. I have no rush to get up, I can lay in bed while the kids scream about the house, play in there rooms, or simply watch T.V. I have no need to fly out of bed unless the words "Scissors" are used in a sentence or things go "to quiet"
It's school holidays when I have no requirement or need to get up at 7am so why does the sun still taunt me through this window. I picked this side of the bed purely because it was closest to the exit if I was needed for the kids in the middle of the night, and closets to the bathroom. Is it to late to swap sides? Have you ever swapped sides of the bed?